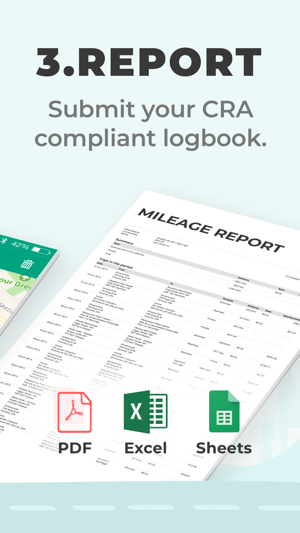 Put your mileage logbook on autopilot: Let your phone track your trips, and have your CRA compliant mileage documentation ready to hand-over at any time. +250.000 trust us with their mileage logbook. Get started for free today! - Simply press start and let the app take care of the rest. 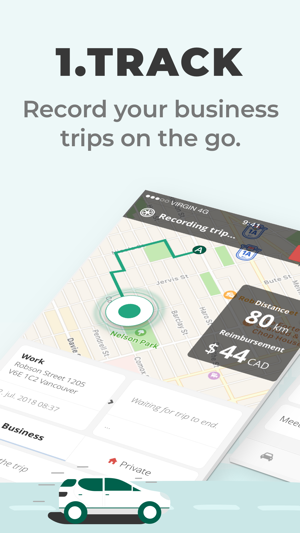 Using your phone’s GPS, we record your trip from start to finish. 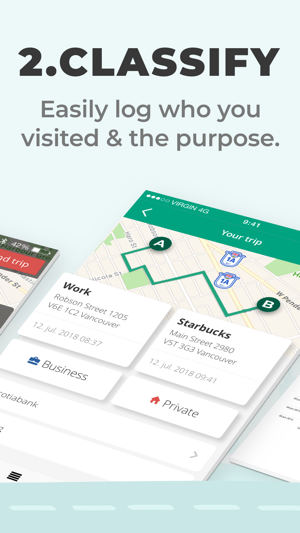 - Automatically tracking of all trips? Go a step further and never forget to log a trip again. With our auto tracking enabled all your trips will automatically be logged in the background. Just keep the phone in your pocket. - Forgot a trip? No worries, you can always manually add a trip later on. Simply select where the trip started and ended and we’ll calculate the route. 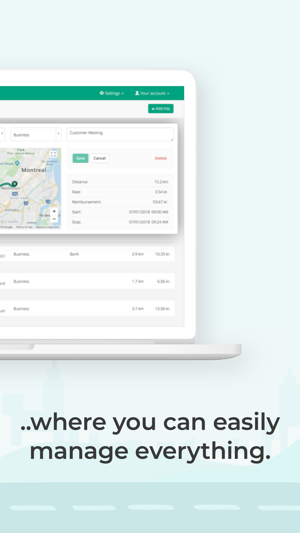 - Easy to categorize your trips as business or private. - Start and stop addresses are automatically logged, and you can easily name the places. 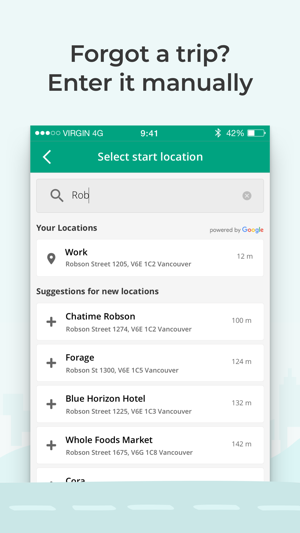 We’ll even suggest suggests companies nearby, so you simply chose who you visited. 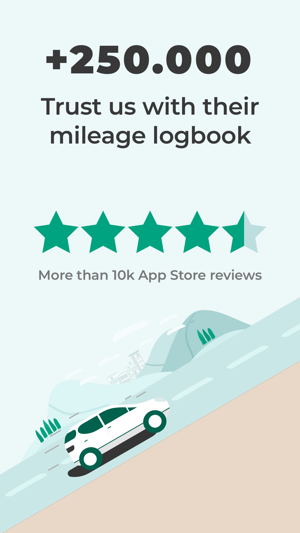 - Do you need to keep a mileage log for multiple vehicles or report mileage to more than one employer? No problem. 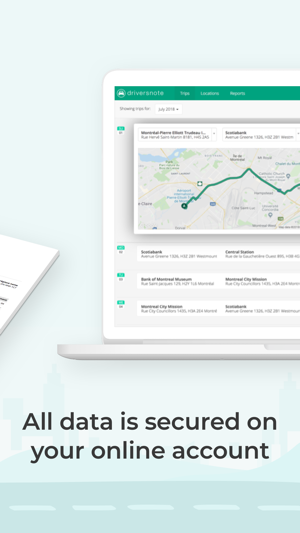 You can easily segment your trips and reporting for different vehicles and workplaces. - Your mileage documentation is ready when you are. You’re only one click away from detailed reports available on mobile or desktop - downloadable as a PDF or Excel file, ready to hand over to your employer or accountant. - The report contains the details required by Canada Revenue Agency (CRA), ready to be used as documentation for e.g. reimbursement claims or tax deductions. - From the get-go, we’ll automatically calculate reimbursements based on the current mileage rates from CRA (that we make sure to keep up-to-date). - If you’d like, you can set your own custom reimbursement rates or choose not to calculate reimbursements at all. - Do you need to log your car’s odometer? We’ve got you covered. You decide how often you log your odometer and we do all the math in between the trips. You can even set up the app to remind your daily, weekly or monthly. - For Canadian users, the mileage rate will automatically change after the first 5,000 km. as required by CRA. - We support the following countries: Canada (CRA), USA (IRS), Australia (ATO), United Kingdom (HMRC), Denmark, Sweden, and Finland. - All your data is secured on your online account, always available even if you lose your phone. - You can easily manage everything from our website. From here you can access all your trips, manage your locations etc. and print reports or download them as PDF or Excel. - Place a Driversnote iBeacon in your car, and the app will automatically record all your trips in the background. You will never forget to log a trip again. - We’ll send you an iBeacon for free, when you sign up for the annual basic subscription. - When entering your car the phone detects the Driversnote iBeacon, and when you drive, it starts recording your trip. No need to open the app. - When you leave your car, the app stops recording, and you get a notification letting you know that the trip was logged. - If you have questions or feedback please contact us at tel. (+45) 71 99 37 54 or support@driversnote.ca. - We do use the GPS in the background when logging a trip, and continued use of GPS running in the background can dramatically decrease battery life. - Some performance improvements in the app while tracking. - Added better validation messages to the Manual Trip creation flow. The auto tracking doesn’t work well. It only records 1/2 or less of my actual trips. Hi Revjohnny, it's fair enough that you would like an app that keeps your log 100% in your own hands. But we provide a service of backing up our users trip to pour servers, so they can access them from desktop as well and also feel safe that their log is not lost in case they loose their phone. I respect that you are not looking for those things, but I feel it's unfair to rate us poorly on that behalf. I hope you found an alternative.